Hub Fabric supplies coated fabric: wovens, non-Wovens, papers, and knits. We also provide consulting to help source the materials & coatings for your product. 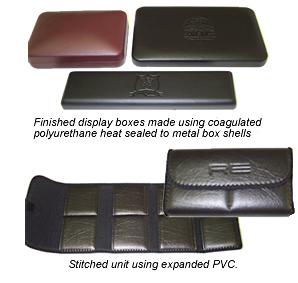 Coagulated polyurethane (PU): The coating surrounds the textile substrate. A polyurethane skin layer is typically applied for decorative purposes. It is typically softer than coated polyurethane. Coated polyurethane (PU): The coating is applied to the top surface of the substrate. The substrate is visible from the back. It is typically firmer but stronger than coagulated polyurethane. Questions? Comments? Contact us by or call 1-508-281-7111. © 2010 Hub Fabric Leather Company, Inc. All rights reserved.